My last order from Teafields came with a little extra gift. Six tiny bags of tea leaves, as samples of their range. I reviewed the White Knight Silver Needle which I actually ordered, but have, until now, not had the time to give the samples the review I think they deserve. Today, I opened one of the black tea samples, “Midnight Musk”. As a 小种 Xiao Zhong (“little type”) the leaves are rather small and short. Smaller than a Keemun or Yunnan Gold. 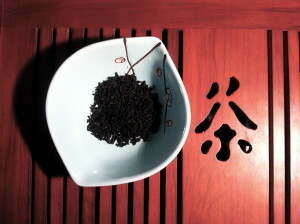 Like its poetic name, the leaves of the Midnight Musk are near black, darker than most other black teas I’ve come across. Fully oxidized, the leaves are deep and rich in aroma, and will have a high caffine content making them a strong stimulant. As I inhale, the sharp scent of fresh fruit, apricot or peach, burst through, followed by a light tail note of musky perfume, which lingers long after as one exhales. Teafield’s brewing instructions are 2.5g (approx. 1 teaspoon) per cup, infuse for 3 minutes. Boiling water works best with 红茶 hong cha. If you’re using a gaiwan like this, please keep the lid on during the infusion. The soup of this tea is a carmine brown, (a good example of why the Chinese call black teas red), and tastes sweet, with a musky, floral aroma that makes you feel like you are drinking from a perfumed cup. Very palatable and mellow, but with a crisp florid head note. The exotic Yemen ambry myrrh and Egyptian musk additions compliment the tea’s natural flavour, without overpowering it. 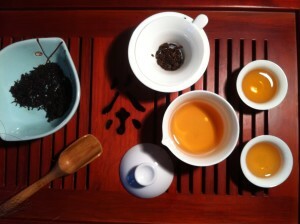 The tea leaves a faint note of astringency, which sits against the initial sweetness nicely. 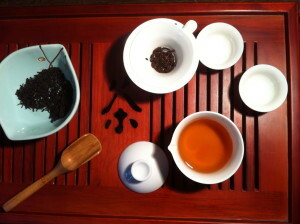 You can tell the traditional method of oxidizing hong cha under damp covering has been employed, producing a characteristic ‘cinder toffee’ taste. 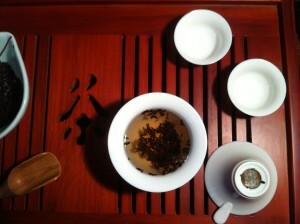 One of the mid-priced black teas from Teafields, it costs £7 for about 40 cups worth. Definitely a blend for contemplative evenings, and I’m sure it will be accompanying me as I sit talking late into the night with friends. If you’d like some Midnight Musk of your own, you can purchase it here.